eatin!, originally uploaded by kendrak. last night i was at kalx until about 9:00 for monamie’s goodbye party. (she’s moving to seattle this weekend.) i’ll really miss her, but i can always go and visit. i came home to find joe keeping vigil over maude, who wasn’t doing too well. she was laying on her side and quickly fading. it was terrible to see her like that, but she seemed pretty peaceful. we talked to my brother, to see if there was anything we could do to ease her, but he said it was more or less a matter of time. she died early this morning. the last few months were really turbulent for her, and she definitely put up a fight. 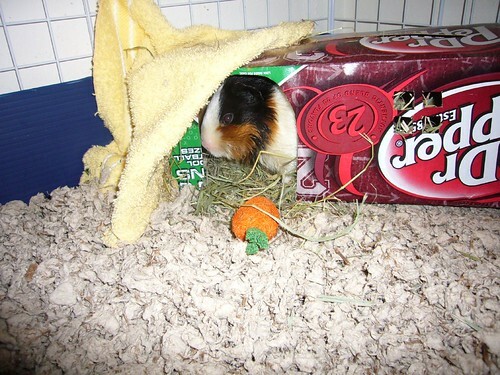 she was a guinea pig with a great personality and quite tenacious. i know robojoe and i will miss her a lot. tomorrow we’re going to go to carmichael and bury her under the parsley outside my parents’ kitchen. i think she’d like that. peeking., originally uploaded by kendrak. here’s a recent picture of maude. she looks a little weird here, but it’s because she just had a bath. remember a month ago when i said maude was dying? well, we’ve been to the vet twice since then, and she seems to consistently getting better. we still have to take her in for check-ups/get her teeth clipped every couple weeks, but she refuses to die. this morning the vet stated a couple of times that he was pleasantly shocked that she not only hasn’t died yet, but is gaining weight and eating lots. i figure we must be from the same stuff- we have the fighting spirit that can’t keep us down. of course, her condition could change any moment and she could drop down dead, but until then, she seems to be returning to normal. she’s starting to beg for food again and she’s getting excited at the sound of plastic bags. today the vet recommended that we feed her rolled oats. i put some in her dish this morning and she ran out, sniffed them, and then ran away. now she can’t get enough of them. it’s amazing what she’ll eat. i know the blogging’s been scant, but i’ve been busy on bigger and better things. first of all, i’m djing at kalx again. (sunday mornings, 9:00-noon… tune in!) 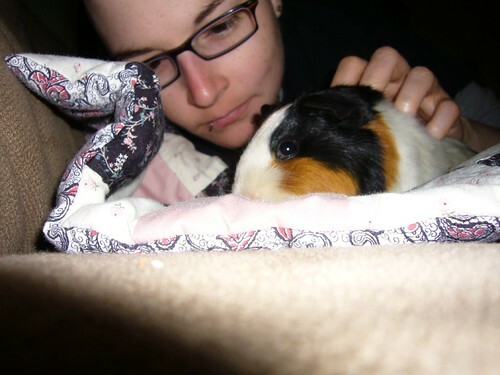 there’s also cavy watch 2007- where i make maude’s still alive. so far i’m not convinced she’s actually dying because she won’t stop eating, but it’s nothing i’m going to complain about. i also have a bunch of library related stuff in the works. oh, and there will be a thundershevitz record release/elbert’s birthday/my cancer victory party in a few weeks. but really… i’m too weak from this juice fast. i’m hoping to only drink fresh juices and pureed fruits and veggies until at least friday if not sunday. it’s stupid and i’m hungry, but it’s just something to do. maude’s dying. the vet pretty much told us this morning. he commented that he’s surprised she lived this long after the teeth problems began. until she finally does kick the bucket (who knows how long it’ll be), i need to keep her dry and as happy as possible. problem is, she hates it when i bathe and dry her. oh well. eat a carrot and think of her. last night robojoe and i stayed at a howard johnson in victorville, ca. it was nice. my mini-vacation is over, and i have to leave now to go talk to the transportation folk at uc irvine. what fun. he’s what’s been going down since last friday- maude is with my brother in sacramento. he’s feeding her baby food. she’s doing ok. we went to a bunch of ghost towns, and they were fun. i won $13 on penny slots. i ate a bunch of donuts and will eat a bunch more. we’ve driven more than 1000 milles. we played a bunch of pinball. i fell all professional with my ironed shirt and fancy schmancy laptop bag. i should call it a satchel. maudey_02, originally uploaded by jgebis. maude’s back at the vet with more teeth problems. this time her back teeth. she has molar malocclusion and needs to be put under so the vet can chip out the little bone spurs. there’s still a chance that they might come back, which isn’t very nice. there’s also the chance she might die from the anesthesia. yesterday was a big day at the house’o’pie. i turned in my networking final, which means i am done with the summer quarter. today is my first cancer free, school free day since i came back from england in january. makes me think it’s time for me to go back again, though i’m worried if do make another trip over there that i’ll develop another serious disease a month later. it was also a big day because robojoe and i tool maude to her first appointment at the vet. it meant i had to miss most of the england euro qualifier against israel (and michael owen’s goal), but maude’s worth it. see, she broke a tooth a while back. 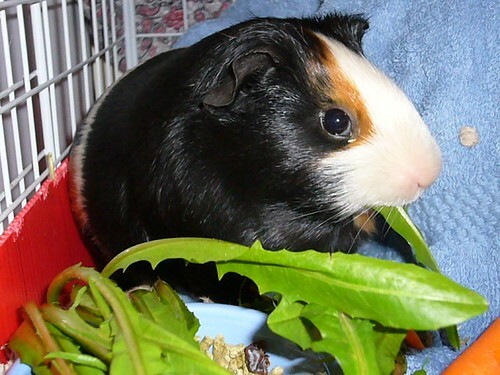 the internet said if you give them things to chew, the guinea pig will correct it on their own. maude didn’t and it got worse and one tooth grew too long. it was really nasty. so i looked around for a good vet in berkeley that had a good history with small pets. 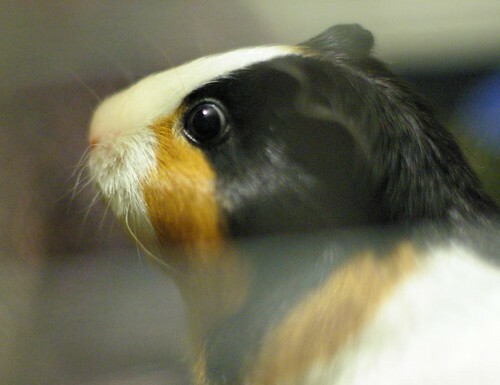 we live across the street from the campus veterinary clinic, but they didn’t seem to have the best customer service reviews and had nothing on the internet about guinea pigs. i settled on the berkeley dog and cat hospital because they had good reviews, and a couple of them were from cavy owners. maude wasn’t too terrified. she acclimated to the pet carrier after a while. i think she could tell that joe and i were nervous. the vet was nice and said that her mouth was a little sore from the overgrown tooth, but she was ok for now since she was still eating. the vet said other than that, maude was in good shape and eats a healthy diet. he then took her away to cut her teeth and trim her nails in a back room. when she came back, she seemed allright, but her mouth is a little tender. so we gave her a bunch of blue berries. the end. one eye, originally uploaded by kendrak. it’s been a while since i posted a picture of maude, so i figured why not post this one? i think it’s from thursday post-chemo. she’s been really good at begging for attention lately, but she hasn’t been so keen on carrot or apples. it’s weird. i don’t know what she wants, and when i give her treats she seems disinterested yet she won’t stop wheeing. oh well. she’s cute and i think she likes me.